Dr. Elizabeth Douglas orbited the cool, stiff body on its steel gurney, and examined the 42-year-old man's fleshy canvas of faded tattoos like an art aficionado in a gallery. She committed each to her notes in painstaking detail and debated whether to use the word "cowboy" or "bandit" to characterize the dull, smudgy image of a horseman midgallop. But that would be the last time the doctor would let herself consider who the man on the gurney once was -- at least for the next two hours, while Douglas ferreted out a cause of death among his organs and entrails. To read more about what goes on in a coroner's office and how pathologists are trained, read the original article in Cleveland.com. Though I am not a pathologist, as a internist who teaches 2nd year medical students, I find that the special experience of a few hours watching the work of pathologists and their helpers in the coroner's office is a popular and thought-provoking experience for the students. The session provides an additional dimension to their experience with the deceased which was started in the opening days of medical school in gross anatomy. 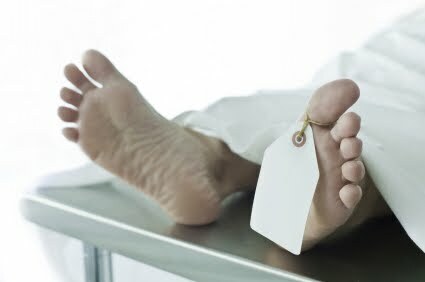 Though the coroner's office provides some refreshing of their knowledge of human anatomy, more importantly it emphasizes the complexities of human behavior and the diseases which lead to and terminate in death. Leaving the coroner's office, having been fascinated and perhaps a bit emotionally shaken by what was seen, by this experience, I think, the students will have significantly matured to the understanding of both what will be their upcoming clinical medicine challenges in diagnosis and treatment but also remind them, in case they forgot, about the, at times, unexpected or unwanted conclusion of all lives. ..Maurice. Graphic: Coroner. Reproduced here as fair use. Graphic was copied from In the Opinion website. Would you dare to refuse to have the batteries replaced? Here is a question that I posed on Medpedia, medical information and discussion site. I thought I would also challenge the visitors here. ..Maurice. dare to refuse to have the batteries replaced? Would your decision be any different if she was being cared for in a nursing home institution? Would refusal to replace failing batteries be any different than making a request to the patient's doctor to have the pacemaker with functioning batteries to be turned off? In answering these questions let's assume your mother never had anticipated having the need for a cardiac pacemaker so had never discussed with you about replacing batteries or for what reasons to request that it be turned off. ..and the story continues. For those who haven't been following this thread over the years, the story is one of patient bodily modesty and the need by some for gender selection of their healthcare providers. This need is apparently often not satisfied by physicians or other parts of the medical system, particularly in the case of male patients who desire a male provider. There are other aspects of the patient modesty issue that have been discussed including the inability of the patient to be assured that his or her modesty concerns will be attended to during operations or other procedures where modesty sensitive parts of the patient's body could be exposed to unknown persons of a gender unacceptable to the patient. If you haven't been here before and have an entirely different view, please be welcome to express that view here. As usual, keep the comments constructive and civil but write. ..Maurice. NOTICE: AS OF TODAY JANUARY 8, 2011 "PATIENT MODESTY: VOLUME 37" WILL BE CLOSED FOR FURTHER COMMENTS. YOU CAN CONTINUE POSTING COMMENTS ON VOLUME 38.